Steven Universe Season 3, Episodes 1 thru 4. 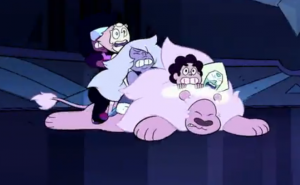 The fun continues now that the cartoon Network has released Steven Universe season 3. What follows is an overview of the first 4 episodes in the Steven Universe Season 3 guide, and episode list. I will post the next 4 right after they Air! If you landed here but are looking for Season 1, or Season 2 just click the links. Steven’s Birthday: Steven has another birthday, he decides its time to “grow up”. It Could Have Been Great: Steve and the Gems head for the moon. Message Received: Steven starts to have doubts about believing in everyone. Log Date 15 7 2: Not always a good idea to snoop in someones diary. Steven listens to his friends audio Diary. Sorry its only the first 4 episodes but that’s all that is available right now. I will post the next 4 once they are out. You can like my Facebook Page and know when I post it.